I've had several cases over the years of a student eating a turkey sandwich for lunch at a tournament, and getting sleepy afterwards. This is presumably because of the relatively high levels of L-Tryptophan in turkey. Now this is controversial - while there's no question L-Tryptophan can cause drowsiness, it supposedly only happens if given almost in pure form on an empty stomach. 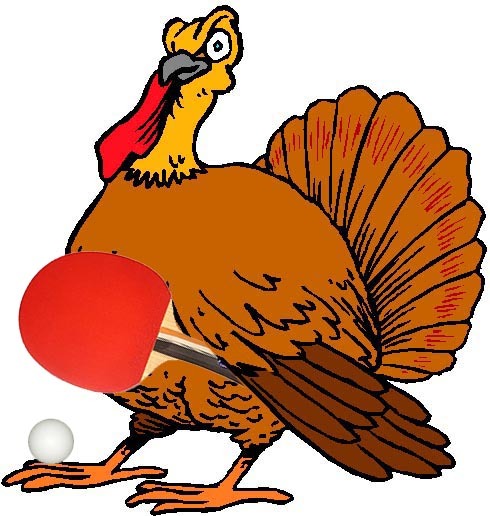 Regardless, I've had enough bad experiences with this that I warn all my students never to eat turkey during a tournament until they are done playing for the day. For example, I was coaching U.S. Cadet Team Member Tong Tong Gong at a tournament last year. He had a turkey sandwich for lunch. When he had to play soon afterwards, he complained of sleepiness, said he could barely keep his eyes open. I took him into the restroom to splash cold water on his face, and it helped somewhat. He struggled for a couple matches before he felt alert again. This is probably the only article ever that combines these three topics. Plus a bonus picture of a bearded Forrest Gump running. They call it Turkish Table Tennis (1:03), but it looks to me like a game of Around the World with some dancing thrown in. Yes, the long-awaited clash between these two table tennis powers (2:52). 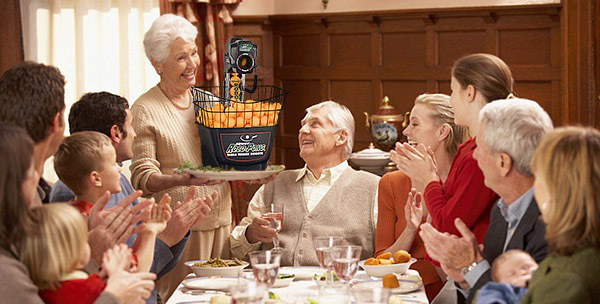 For Thanksgiving dinner, there's nothing like grandma serving a roasted Robo-Pong with ping-pong ball stuffing. Really! Winner gets the turkeyball. Are you ready to cut up a turkey with a blade, and serve it? Well, this turkey also has a blade and he's also ready to serve. (It's just a larger version of the turkey at the top.) Happy Thanksgiving!